Foodies unite! The Capital One® Savor® Cash Rewards Credit Card was made to help you earn rewards for spending on your biggest hobby, whether you like to cook, eat out or both. Everything you spend on dining out and on entertainment will be rewarded with 4% cash back, you’ll earn 2% cash back at the grocery store and 1% cash back on other purchases. You can boost your rewards earnings with a $500 sign-up bonus when you make $3,000 worth of purchases during your initial three months with an account. There are no rotating categories, limits, expiration dates or redemption minimums attached to your cash back earnings. In other words, what you earn, stays yours with no questions asked. Your cash back can be redeemed in a multitude of ways, including as a check, statement credit, gift card and more. There are no foreign transaction charges while abroad, even further lowering the financial impact of becoming and remaining a cardholder. Unlimited cash back rewards - You’ll earn 4% cash back on dining and entertainment, 2% cash back on groceries and 1% cash back on all other purchases. As long as your account remains open and in good standing, your cash back won’t expire, and there’s no limit to how much you can earn. No rotating categories – There are no rotating cash back categories to keep track of with the Capital One® Savor® Cash Rewards Credit Card. $500 sign-up bonus - Spend at least $3,000 in purchases over your first three months as a cardholder, and you’ll earn $500 cash back. Redeeming your rewards - Cash back earned is most commonly redeemed in the form of a statement credit or a direct check, but you’ll have other options as well, including gift cards to retailers. You can make redemptions whenever you want as there are no minimums to redeem. No foreign transaction fee - There are no extra fees for using your Capital One® Savor® Cash Rewards Credit Card on purchases outside of the U.S. 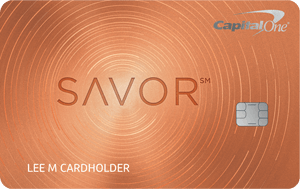 Exclusive cardholder benefits - The Capital One® Savor® Cash Rewards Credit Card features perks exclusive to the World Elite Mastercard® program. Concierge - This 24/7/365 service is meant to help you make the most of your trips. Whether you need help booking a hotel stay, show or dinner reservation, Mastercard’s personal assistants can get it done. Vehicle rental insurance - When renting a vehicle for 31 days or less, Mastercard has you covered for the physical damage or theft of your car, as well as a few other related charges. You must pay the entire rental bill with your Capital One® Savor® Cash Rewards Credit Card and turn down the rental company’s insurance to be eligible. Price protection - Purchasing an item with your Capital One® Savor® Cash Rewards Credit Card covers you for a reimbursement of the difference between the price you paid and a lower price, if you find the lower price within 120 days of the original purchase date. Extended warranty - Items with manufacturer’s warranties of 24 months or less will have them doubled up to 24 months. Travel assistance - Traveling in the U.S. and your car breaks down 50 miles or more from home? Call Mastercard’s card services and it’ll send help with whatever you need. Any extra charges incurred during this process will be your responsibility. Baggage delay insurance - If the arrival of your luggage is delayed by your travel carrier, you’ll be reimbursed for purchases of personal items, up to $100 a day. You’ll earn 4% cash back on dining out and entertainment, 2% cash back on grocery purchases and 1% cash back on other purchases you make with the Capital One® Savor® Cash Rewards Credit Card. Spending at least $3,000 during your first three months as a cardholder will earn you an additional $500 cash back bonus. Don’t worry about expiration dates, caps or redemption minimums placed on your cash back earnings, so feel free to use them whenever you see fit. There are no rotating categories as well, so you won’t miss out on rewards if you forget to opt in. The Capital One® Savor® Cash Rewards Credit Card is a cash back credit card meant for people who spend a lot on dining out and groceries and the rewards structure is built accordingly. In other words, the rewards for spending outside those categories aren’t particularly high. All purchases made on dining out and entertainment earn 4% cash back, you’ll earn 2% cash back for buying groceries and 1% cash back on all other purchases. You can also get a $500 sign-up bonus when you spend at least $3,000 during your first three months with the Capital One® Savor® Cash Rewards Credit Card. All balance transfers will incur a 3% fee. 0% introductory APR for 15 months. After that, your APR will be 16.74%-25.74% variable, based on your creditworthiness. This APR will vary with the market based on the Prime Rate. 25.74% Variable. This APR will vary with the market based on the Prime Rate. How to Avoid Paying Interest on Purchases Your due date is at least 25 days after the close of each billing cycle. You will not be charged interest on new purchases, provided you have paid your previous balance in full by the due date each month. You’ll be charged interest on cash advances starting on the transaction date. Balance Transfers 3% of the amount of each transfer that posts to your account within the first 15 months. Cash Advance Either $10 or 3% of the amount of each cash advance, whichever is greater. The Capital One® Savor® Cash Rewards Credit Card is a great option for someone who spends a lot on food, whether they like to cook or dine out regularly. But how well does it stand up to the Sam’s Club® Mastercard®, a stalwart of this rewards field? As far as cash back percentages go, the Sam’s Club® Mastercard® beats the Capital One® Savor® Cash Rewards Credit Card by offering 5% cash back on gas, 3% cash back on dining out and travel and 1% cash back on other purchases. However, unlike the Capital One® Savor® Cash Rewards Credit Card, there aren’t any sign-up bonuses to supplement your early rewards benefits. The 5% rate applies to only your first $6,000 of gas purchases yearly, and all cash back is limited to $5,000 in annual earnings. These are pretty high limits, and most cardholders probably won’t reach them. Cardholders who have a Sam’s Club membership won’t have to pay an annual fee for the Sam’s Club® Mastercard® and there are no foreign transaction fees either. The variable APR with the Sam’s Club® Mastercard® will fall at 17.15% to 25.15%, and there’s no intro APR. There are pros and cons to both cards but perhaps it comes down to which food category you tend to spend the most on. If you spend more on dining out (and you drive a lot), the Sam’s Club® Mastercard® may make more sense for you. But if you prefer to shop for groceries and do your own cooking, then you may prefer having the Capital One® Savor® Cash Rewards Credit Card in your wallet. Food is the name of the game with the Capital One® Savor® Cash Rewards Credit Card - just as its name implies. It provides great grub-related cash back rewards, including 4% cash back on dining purchases and 2% cash back on groceries. If you’re a big spender in these categories and you’ve been searching for a credit card that will reward you accordingly, then you may have found your perfect match.